Orange and black are the colors most often associated with Halloween and so it makes sense that carrots should be part of the fun! 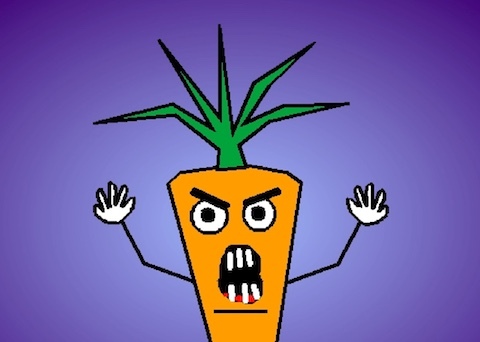 Just imagine a huge, terrifying carrot with bad intentions pursuing you through the dark streets Halloween night. Sounds like the stuff nightmares are made of, right? Sure, carrots might be considered healthy and people might grow them in their gardens all the time, and let us not forget that they make great cake and pretty good juice too. But, that doesn't mean that they don't have an evil, sinister side to them. Their dark past has mostly been forgotten, but they were often used by medieval witches and sorcerers in various potions and brews to cast magic spells on unwitting individuals or to summon wicked spirits and demons. Indeed, carrots fit in quite well with the rest of the Halloween crowd. In fact, you might even find them growing in the same garden along with pumpkins and other vile vegetables! There's nothing more scary than a Killer Karrot!